The black-and-silver replica could pass as an Oakland Raiders jersey were it not for the fact that it's already closely identified with Kaepernick, who recently settled a highly-publicized collusion grievance with the NFL. 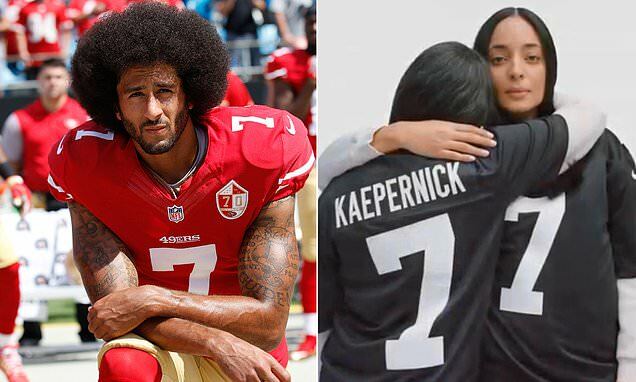 As part of the #ImWithKap social media campaign during Super Bowl LIII, several celebrities were seen wearing similar jerseys, including NBA stars Kevin Durant and LeBron James. The accompanying Nike ad was silent, and featured non-athletes wearing the replica jersey. Nike also makes the NFL's real and replica jerseys, the latter of which can usually be purchased by fans for anywhere between $100 and $150. This is not the first Kaepernick-inspired product from Nike. The University of Nevada product signed with Nike during his six-year tenure with the San Francisco 49ers. However, the company did not put him in any advertisements following his decision to protest racism by kneeling during the national anthem during the 2016 season until September, when Nike made him the face of its latest 'Just Do It' campaign.